Adventures in Argentina : Transfers. I have some news! I am getting transferred! I don't know where though. Maybe Argentina maybe in Fayetteville, I don't know. But I would like a travel visa. I literally cannot wait to get down to Argentina and use nothing but Spanish! I am going to miss this area though. This area was full of Hispanics. Mostly Guatemalans and Mexicans. I have come to a conclusion that Hispanics and better than white people. White people are prideful! Well, at least here they are. I think Hispanics are more humble because they come to the United States to better their quality of life. And so when we say our message will help your quality of life, they jump right on it! This week was full of ups and downs. First off, Elder Zemcik and Elder Graves (we were on exchanges) picked back up an investigator named Adriana. Adriana told them that she wanted them back because all these bad stuff have been happening since we dropped her. And she said she repented and everything and actually wants to be baptized! Isn't that great? Except, there's a problem. She's a bit lazy. Elder Zemcik and I decided to be teaching her the lessons again before her baptism on the 31st. So we used the pamphlets and started teaching her the Restoration again. She did not pay attention to anything we had been telling her for the past 6 weeks. For example, after we read in the pamphlet about the restoration of the priesthood, we would ask here why it was important to have the priesthood. She would answer that she doesn't know. So we would have to explain to her the importance. And she would just shrug off the explanation and say yeah yeah. And we asked her this Sunday if she was actually going to come to church. She was definitely sure and said that she really wants to get baptized. Of course, the next day, the same thing happened. She didn't come to church because she was too sick. This really bugs me because she said she wants to change her life and said that she repented and will do anything to be baptized, but they don't commit. So we are going to drop her again. I'm done teaching her for now. She just doesn't understand the importance of church and everything. We try telling her these things, but she just doesn't listen. Another investigator we have is named Mauricio. Mauricio is doing really good with his alcohol problem. He is my favorite! He trys so hard to do the right thing. He really wants to change. But, the sad thing is that he didn't come to church because he was at his brother's house and when he is usually over there, he drinks. And we couldn't get a hold of him on the phone, tampoco. So we have to pick him back up and encourage him. But, he is really trying and doing a lot better. He is following the goals that we have on his calender to baptism. 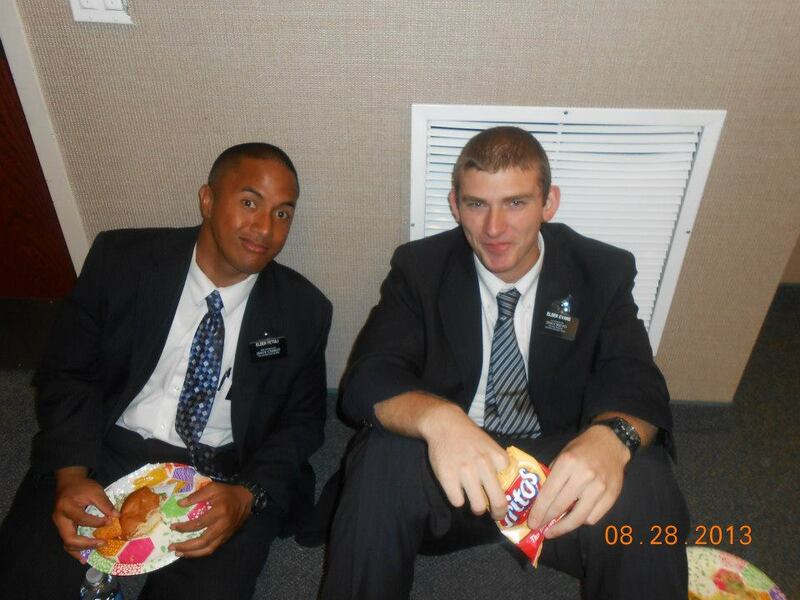 So he will get baptized in about 2 weeks hopefully. We met some crazy people this week. There was a white lady that we ran into. I think her name was Christina. Anyways, I thought she was cool at first but, she must have been high or something because she was crazy! And she was just coming back from rehab too! White people are nuts. She kept yelling at the Hispanics in their complex and yelling, "Ocho Cinco!" over and over. So we said a prayer with them and left. We met a couple this week named Ana and Mario. Cool story about Ana is that she might be a member! She said she has done baptisms for the dead in Mexico before. So we got her information and hopefully we can get her records transferred over here. They are a great couple, but sadly, we haven't had enough time to give them the first discussion yet. I went on exchanges my first time this week. I sure learned a lot of things of what to do and what not to do. We met some nice people, but you could tell they weren't interested and my district leader kept being persistent and wanting to give them a blessing. All the people just full out rejected us. But what I did like, was that when he would ask for referrals, he would ask if there was someone going through a life-changing event, like a birth or a job or something. Most of the answers would be no, sadly. I also learned not to chase people down the street to give them a blessing. People don't like that. Well, my Spanish is getting a lot better. It's really hard to understand Guatemalan spanish compared to Mexican spanish. Guatemalans like to mumble and say uh-huh a lot. It's going to mess me up in Argentina if I ever get to go there haha but I love it here! The people here are so nice! I do have pictures, but I forgot my converter thing. Love you all! Make sure to read 3 Nephi 27 to Mormon 2. There are some pretty sick stuff in there. Mormon is a stud!